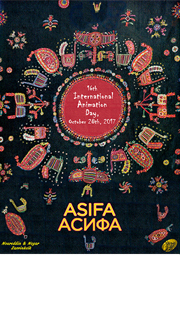 In 2002, ASIFA (Association Internationale du Film d' Animation, registered in Annecy, France) decided to celebrate this historic day as "International Animation Day", aiming to promote and develop animation art all over the world. ASIFA National Groups started to hold the celebration on and around October 28th, as a simultaneous manifestation in various countries. 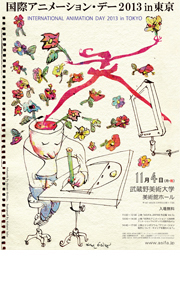 ASIFA-JAPAN also decided to join this international art manifestation in 2005, and has been participating since then. International Animation Day 2018. See details. Yokokawa cinema, Hiroshima City Museum of Contemporary Art, Kure Municipal Museum of Art, Kyoto University of Art and Design, Nonoichi-shi 'Camellia'. the Eizo Hall of “Art and Culture Information Center” , Hiroshima City Cinematographic and Audio-visual Library, etc, Osaka Designer's College. Musashino Art University Museum & Library, the Eizo Hall of “Art and Culture Information Center” , Hiroshima City Cinematographic and Audio-visual Library, etc.